In addition to the module for onboard stability and strength, Autoload also includes an advanced Ship Planning System - a software tool for cargo management and stowage as well as for booking. The Autoload software is available in versions suitable for any vessel type, including a wide range of operational conditions. It can be fully integrated in the ship operator's logistic chain of cargo handling, so that it can be accessed from terminals ashore as well as onboard the whole fleet of vessels. Example above is from a Ro-Ro vessel. 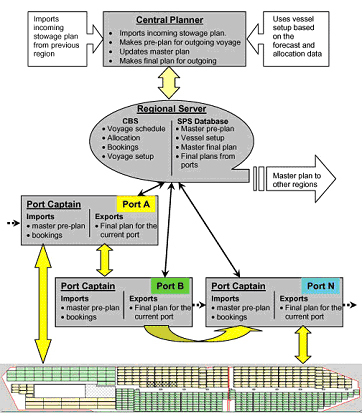 Graphical cargo stowage planning specific to different types of ships and cargo, e.g. “drag and drop” feature from booking list directly to decks. Direct link to the on-line hydrostatic engine. Powerful report engine, generating e.g. detailed deck stowage plans (single or overall). Communication component - EDI interface with third party software systems. Due to its modular structure the Autoload ship planning system is highly flexible and customizable, not only for different ship types but also for the global operations of a shipping company. Autoload provides management solutions which both improve cargo handling efficiency and fully integrate planning operations into the real-time logistical chain. We have e.g. delivered an integrated ship planning system for the complete Wallenius Wilhelmsen fleet. For further references, please see separate section.